MS. Lincoln College Lat. 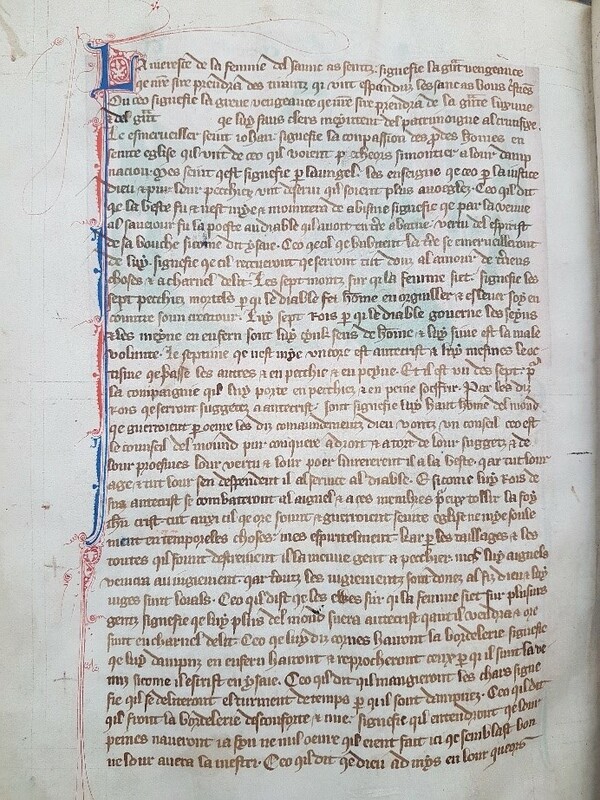 16 is a fourteenth-century English manuscript which has been held at the Bodleian Library since 1892, when it was deposited from Lincoln College, Oxford. It is composed of a commented Apocalypse of St John in Latin (ff. 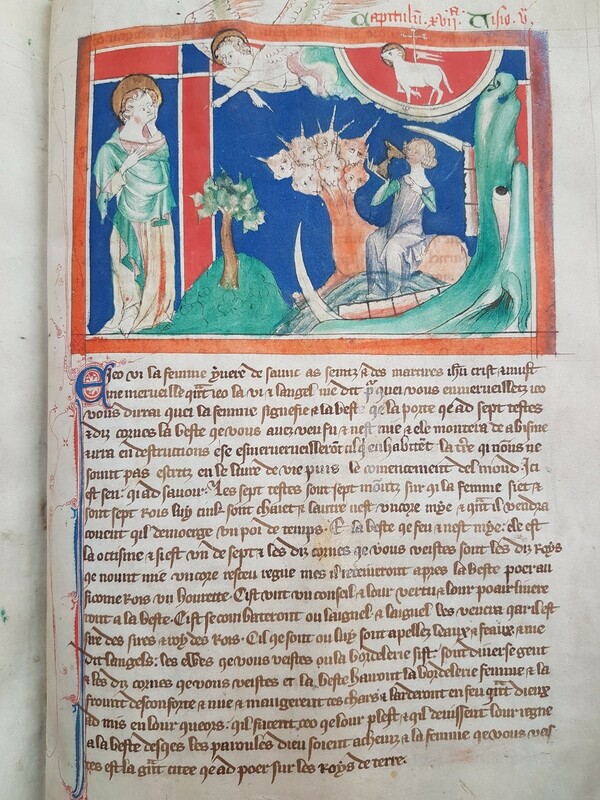 1-138), and a commented Apocalypse of St John in French which also features numerous illustrations (ff. 139-181). 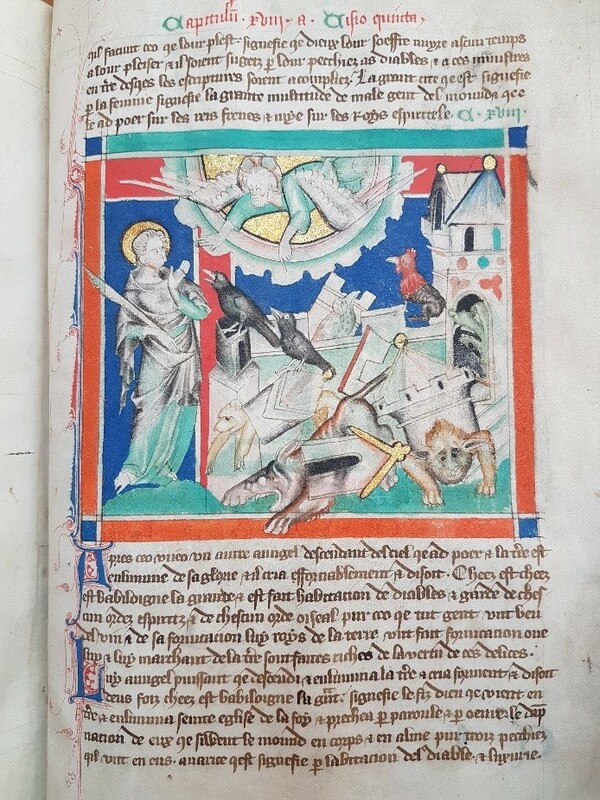 This Apocalypse in French, generally known as the French Prose Apocalypse so as to distinguish it from the French Verse Apocalypse, survives in around forty manuscripts. 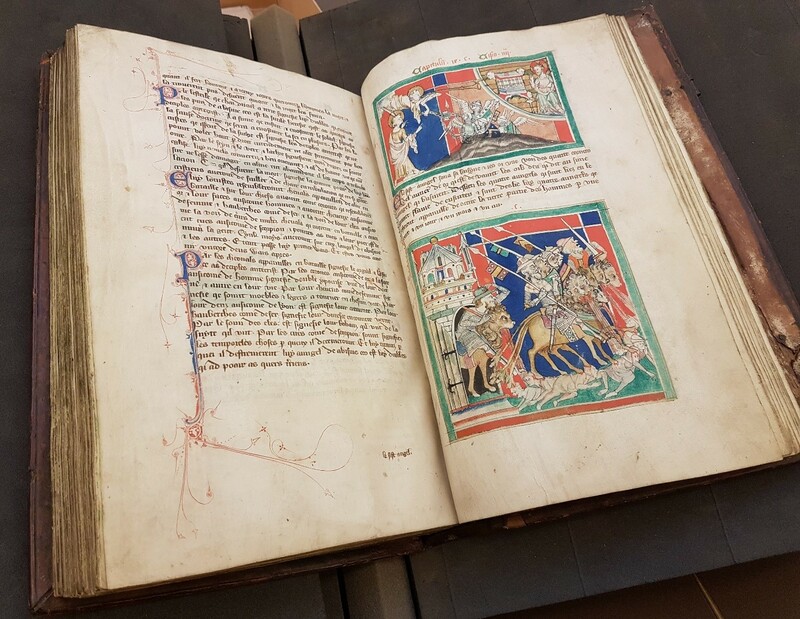 Despite its popularity and dissemination in the Middle Ages, this text has been largely overlooked by modern criticism, and fundamental questions remain unanswered concerning its date, author, origin and transmission. Through the ‘Apocalypse in Oxford’ project in particular, Burrows proposes to take a close look at MS. Lincoln College Lat. 16 as well as four other manuscripts containing the French Prose Apocalypse: MS. Bodley 401, MS. Douce 180, MS. Selden supra 38, and MS. University College 100. 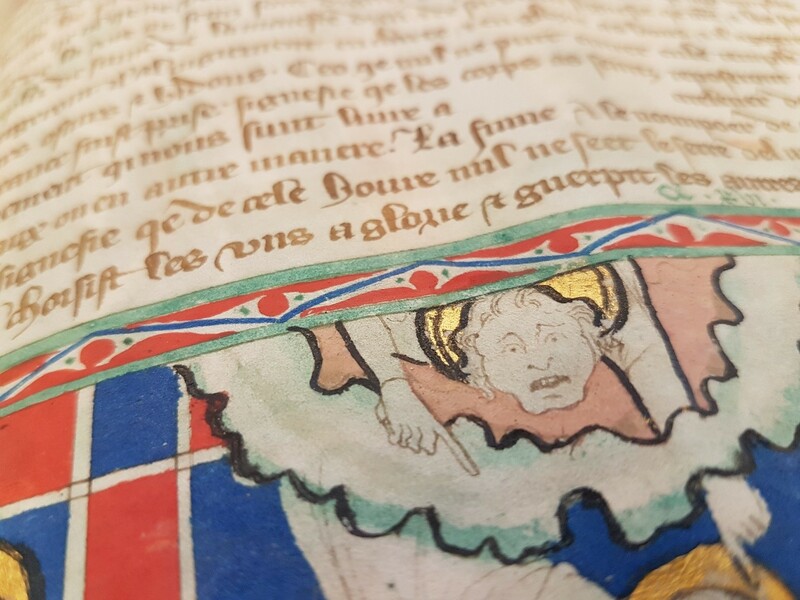 More information can be found on the website http://apocalypse.bodleian.ox.ac.uk/. My own work is a contribution to this project. In proposing the diplomatic transcription, edition, and palaeographical commentary of an excerpt from MS. Lincoln College Lat. 16, I hope to advance at my humble level our comprehension of the French Prose Apocalypse. The chosen excerpt consists of ff. 170r-171r and offers a translation from Latin to French of the passage of the Whore of Babylon as well as its accompanying exegesis. The writing is clear, as can be seen on the pictures above, yet greater care seems to have been given to the illustrations – a rather typical feature of French Prose Apocalypse manuscripts, which meant that I had to pay particular attention to scribal errors and imperfect correction. Segments of the text are often missing, and the other manuscripts of our corpus had to be used to fill in the gaps. My work is accessible on the following page: http://apocalypse.bodleian.ox.ac.uk/home/lincoln-lat-16/. [i] Paul Meyer, L’Apocalypse en français au XIIIe siècle (Bibl. nat. fr. 403): introduction et texte (Paris: Firmin Didot, 1901). [ii] Daron Burrows, ‘Vers une nouvelle édition de l’Apocalypse en Prose’, in Anglo-français: philologie et linguistique, ed. by Oreste Floquet and Gabriele Giannini (Paris: Classiques Garnier, 2015), p. 31.